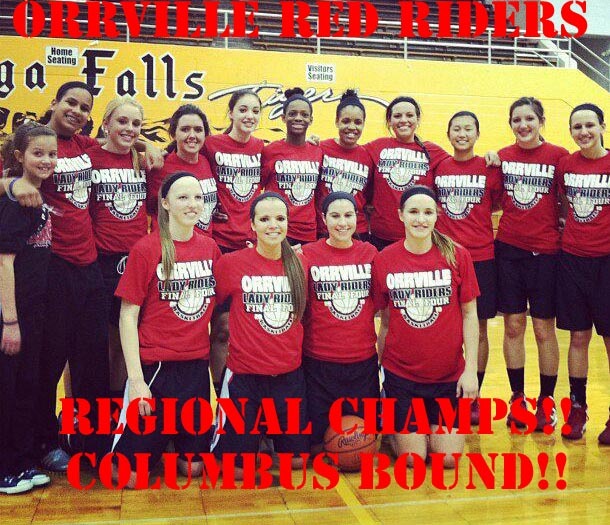 Orrville Red Rider Sports Blog: Orrville Girls Win Regionals. FINAL FOUR BOUND!! Orrville Girls Win Regionals. FINAL FOUR BOUND!! 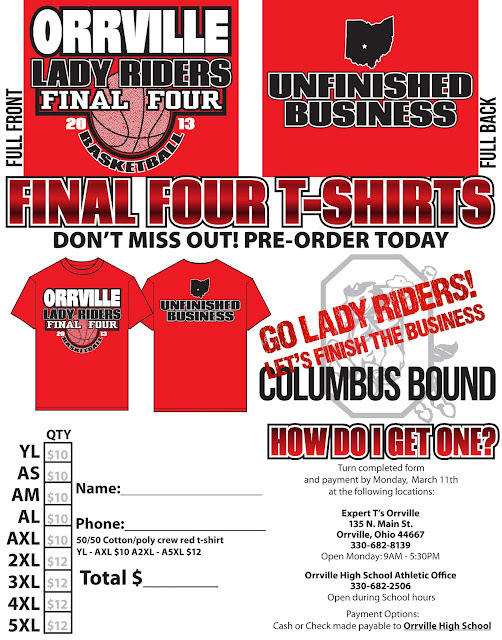 For the first time since 1993, the Orrville girls basketball team has captured a regional championship and will head to Columbus looking to win the program's first state championship. In convincing fashion, the Riders steamrolled Beachwood 75-48 to punch their ticket to the Division 3 Final Four where they will face the Anna Rockets, who defeated Middletown Madison 61-42 today. The Riders started hot today against the Bison, scoring the first 9 points of the game and never looked back in leaving little doubt as to who was the better team on this day. Leading the way for Orrville, as she has all year, was senior Hannah Plybon. She had one of the greatest post-season efforts of any Orrville athlete, tallying a school record 42 points and adding another 15 rebounds. Her effort broke the record of 40 points set by Stacie Howard in the 1988-89 season. Many of Hannah's points came at the foul line as the Bison had no answer on defense against Hannah, resulting in lots of fouls that Hannah turned into points at the charity stripe. The Bison closed the gap to 6 points in the 3rd quarter, but the Riders stretched the lead back to double digits, leading 50-37 after three quarters and ballooned to 60-42 with 4 minutes left. It was just a matter of running the clock to 0:00 and the Riders would be headed back to Columbus. Just really amazed at the effort Hannah put forth today..to play that big, in a regional final, just speaks to her experience and her ability to rise to the occasion. As has been custom in the last month or so, today also saw some more records fall. Aside from setting the single game scoring mark of 42, she also eclipsed the single season scoring record of Rider great Kevin Summers. Coming into the game, she had 657 points on the season, with Summers record of 673 within striking distance. Her 42 points now gives her 699 on the season, a new OHS record...and with her first point in Columbus this Thursday, she'll cross 700 points on the season. That's a solid career for any HS basketball player...and Hannah has done that in one season. And she just doesn't score points either. She'll finish in the top 5 of career rebounds and in the top 2 for assists. She's the complete player...and why she should win Division 3's Player of the Year award hands down. Heck, at this point, let's throw her name in the conversation for Ohio's Ms. Basketball honor. That honor seems to go to a player at a D-1 school, but show me anyone in the state with the numbers she's put up this year. She'll get a third straight 1st team All-Ohio honor in the coming week, giving her 4 All-Ohio honors in her 4 years of high school. Hannah now ranks 2nd all-time in Wayne/Holmes county history (boys or girls) with 2079 career points. Sort of flying under the radar is the fact that senior Maggie Davault is nearing an impressive scoring mark of her own. She's 9 points shy of 1,000 for her career which would be a great accomplishment for her...and would give the team two 1,000 point scorers. The last time we had this, it was on the boys side as Jake Bolyard and Zach Wasson who both achieved the mark in the 2009-2010 season. I said it the other day on twitter...if heart and hustle added to a players height, Maggie would be 9 feet tall. She's the soul of this team and a huge reason why they're 26-2 on the year and headed to Columbus. So glad to see Coach Alberts earn his first final 4 berth after 38 years in coaching. He's coached in 831 games in his career (545-286 record)...and this Thursday he'll coach on Ohio's biggest stage for the first time. Hopefully he gets to coach 2 more this season and it ends with a state title. No disrespect at all to the boys, but this has been quite a run the girls sports teams have been on lately. Going back 12 months, we've had the softball program win the OCC, the girls track program win the OCC, the girls cross country team qualified for regionals, the girls volleyball team made the final 4, the girls swimming team sent 2 relay teams to districts and now the girls basketball team is off to the final 4. That's quite a run. And looking back at the teams who made the volleyball final 4 in 2012 and who have made the basketball final 4 this year, only 1...out of 700+ high schools in Ohio...have made both final fours this year...and that's us. It's the first time both the girls volleyball and girls basketball programs have made the final 4 in the same year. A great accomplishment for sure. The Riders will play Anna this Thursday at 3pm at Value City arena on the campus of Ohio State University. In the other semifinal, Columbus Africentric will play Fort Frye at 1pm. There's plenty of state tournament history here as everyone but Fort Frye has made a Final 4 and Africentric has won 2 state titles and is making their 5th final four appearance. Anna won the state title in 2011 and is making their 3rd straight appearance in the final 4 and has 5 appearances total, also winning a state title in 1981. This is Orrville's 3rd final four appearance with 1 runner up finish. I wouldn't be surprised to see Africentric waiting for the Orrville/Anna winner. I'd really like to see our girls matchup against them. They beat Archbold 60-42 today, and did so despite committing 25 turnovers. They do it with athleticism and pressure defense. This is also the 28th time an Orrville team has made the final 4 or finished 4th or higher in the state (in sports like track & wrestling). Looks like I need to update this list. It was 26 Final Four's, but I found out that the OHS golf team finished 4th in the state in 1975...so adding that and today's win by the girls gives us 28. As seems to be the norm, the Wayne/Holmes county area will again be well represented as both West Holmes (D-2) and Hiland (D-4) are in the final 4 also. How neat would that be if D-2, D-3 and D-4 all went to the locals? Monday- 7:30 a.m.-3:00 p.m. Students and players families only out of the Orrville High School Athletic Office. Monday- 6:00 p.m.-8:00 p.m. Open to the public for sale. They will be sold from the Orrville High School front lobby. Tuesday & Wednesday- Tickets will be sold from the Orrville High School Athletic Office from 7:30 a.m.-3:00 p.m. Tickets will also be sold from Expert T’s in downtown Orrville from 10:00 a.m.-5:00 p.m.
· There will be NO ticket sales on Thursday. · All presale tickets are $8.00. Tickets at the gate will be $10.00 or $12.00 depending on seat location. · All tickets are reserved seats. · The parking fee is included in the price of a ticket. · Maps and additional information sheets will be available when purchasing your tickets. I'm told that 1 ticket is good for both games, so fans can show up early and catch the first game. Courtesy of Expert T's, here's your Final 4 T-shirt design & order form. If you want a shirt in time for the game, get your order in on Monday. Click here to print out a form. So...just two more wins and this team that has accomplished so much and broken so many records, can call themselves state champions. It certainly wont be easy, but I think this is a special group at a special time...so we've got a shot. This group really deserves it and it would only be fitting that this would be the team to bring home the gold trophy....they play hard, play as a team, and support each other. Their motto all season has been "Unfinished Business," and they're 2 wins from finishing. I know there can only be 1 champion...but I really hope it's us...and I think we've got just as good a shot as anyone else. Another Great Day to be a Red Rider!! Orrville Girls Capture District Title!